A work of literary non-fiction that travels deep into the grief, the trauma and the mysteries of the remote communities that lived through the Japanese earthquake and tsunami is tonight, Tuesday, 8th May, named the winner of the 2018 Rathbones Folio Prize. 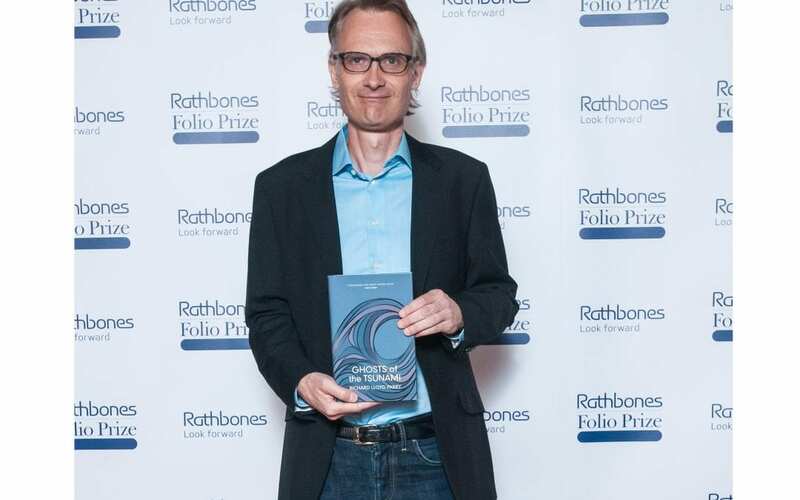 The foreign correspondent and Asia Editor of The Times Richard Lloyd Parry receives the £20,000 prize – which rewards the best work of literature of the year, regardless of form – for Ghosts of the Tsunami. Lloyd Parry, an award-winning foreign correspondent, lived through the earthquake in Tokyo, and spent six years reporting from the disaster zone, where he encountered ghosts and hauntings, and observed how the shock of the disaster continued to express itself in bizarre and mysterious ways. Ghosts of the Tsunami offers a heart-breaking glimpse into the lives of those struggling to find consolation in the ruins. Through the intimate retelling of these personal stories Lloyd Parry has delivered a “fractured portrait of a country we’re more accustomed to seeing as a polished whole” (The New York Times).Ghosts of the Tsunami is published in hardback by Jonathan Cape. The 2018 judges were Jim Crace, author of twelve award-winning books, including Continent, Quarantine, Being Dead, Harvest and The Melody; Nikesh Shukla, editor of the essay collection The Good Immigrant and author of Coconut Unlimited and the widely acclaimed Meatspace; and the award-winning writer and journalist Kate Summerscale, author of books including The Suspicions of Mr Whicher and The Queen of Whale Cay. Ghosts of the Tsunami was chosen from a shortlist of fiction and non-fiction that showed extraordinary international breadth, with works from Ireland, Pakistan, China, North America and the UK in contention for the prize. Lloyd Parry’s win is a triumph for creative non-fiction, and affirms the unique role the form plays in making sense of our complex world. Richard Lloyd Parry was awarded with the trophy and a cheque of £20,000 at the Rathbones Folio Prize ceremony at the British Library tonight. He joins Hisham Matar (2017), Akhil Sharma (2015) and George Saunders (2014) as winners of the prize, which was launched in 2013 in a spirited challenge to the Man Booker Prize. The Rathbones Folio Prize is the only literary prize in which all books – fiction or non-fiction – are judged, strictly on merit, by the Folio Academy, a community of 300+ writers representing excellence in literature.